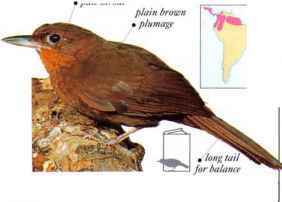 A small, unobtrusive bird, this species inhabits forests at altitudes where the climate is subtropical. It frequents thick vegetation in the lower and middle forest stories, hopping along branches and clambering about actively. Often joining mixed-species docks to feed, it searches tangles of dead leaves for invertebrates. • DISTRIBUTION Coastal range of hills in S.E. Brazil and N.E. Argentina.